Cartoonists from around the world contribute pictures, strips and stories to the Spontoon website. E. O. Costello contributes radio scripts that fit the time and the place. It's Old Time Radio meets the Sunday Comics. We at Great Northern Audio are proud to have helped make some of these scripts into audio so they can be appreciated the way they were meant to be. It's Shot From Guns - 30:42 minutes. 29.5 MB. 128 kbps, Mono. If You Can't Stand the Heat - 40:59 minutes. 39.4 MB. 128 kbps, Mono. CD booklet with artwork and credits in PDF format. 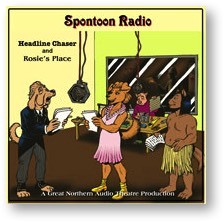 Spontoon Island was created by Mr. Ken Fletcher. The setting is in an alternate, fictional Anthropomorphic universe set in the 1930's. The emphasis is upon Amphibious aircraft, those who fly them and those who maintain them. Located in a warm current and almost directly West of Vancouver, Canada, Spontoon Island and many islets around it have near tropical environments, though they do have cold seasons unlike say, Tahiti. As heard on Spontoon Island station LYRC in 1938, transcribed and edited by E. O. Costello. 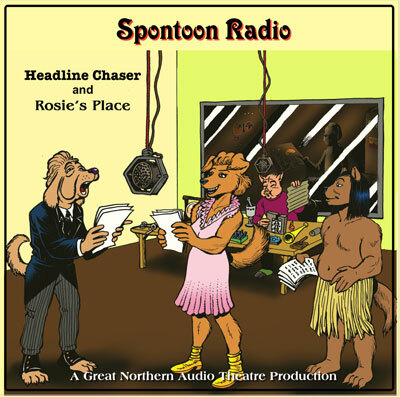 Adventures of Michael Mooney, reporter for the Spontoon Evening Observer. Originally broadcast Sept. 15, 1938. Headline: "Cat Snoops In Kitchen, Ends Up In Hot Water." Subhead: "Doesn't Even Know It Ain't Saturday Night." Mooney hears from his mink lady friend that local restaurants have been losing food right off their loading docks. He's a reporter: he can't help himself. He has to investigate. And there are the others at the newspaper - Editor Jaguarundi, reporter Jimmy Rayzor, and publisher Charles Foster Crane. THE place for lunch on Meeting Island is Luchow's. Originally broadcast Sept. 18, 1938. A restaurant needs lots of clean napkins and table cloths, so Rosie sends dimbulb fox brothers, B'onss and K'nutt, out to do some laundry. B'onss sets up a washing machine powered by an airplane engine. And the usual wacky characters stop by Luchow's - like Nicholai Lopanearov, Rt. Hon. A. Cadbury Mouchoir, Cuthbert Calico and police Sargeant Brush. I am both grateful for the hard work that went into this, and gleeful at the results. Please pass on my compliments to the actors and the technical folks.